The Saab 35 Draken (IPA: [²drɑːkɛn]; 'The Kite' or 'The Dragon')[Nb 1] is a Swedish fighter aircraft developed and manufactured by Saab between 1955 and 1974. 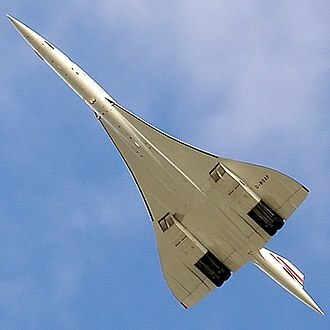 It was the first fully supersonic aircraft to be deployed in Western Europe. The Draken was developed during the 1940s and 1950s to replace Sweden's first generation of jet-powered fighter aircraft, the Saab J 29 Tunnan and, later, the fighter variant (J 32B) of the Saab 32 Lansen. It featured an innovative double delta wing; in order to test this previously-unexplored aerodynamic feature, a sub-scale test aircraft, the Saab 210, was produced and flown. Developed in Sweden, the Draken was introduced into service with the Swedish Air Force (SAF) on 8 March 1960. Early models were intended purely to perform air defence missions, the type being considered to be a capable dogfighter for the era. The Draken functioned as an effective supersonic fighter aircraft of the Cold War period. In Swedish service, it underwent several upgrades, the ultimate of these being the J 35J model. By the 1980s, the SAF's Drakens had largely been replaced by the more advanced Saab 37 Viggen fighter, while the introduction of the more capable Saab JAS 39 Gripen fighter was expected in service within a decade, although delayed. As a consequence of cutbacks and high maintenance costs, the SAF opted to retire the Draken during December 1999. The type was also exported to Austria, Denmark, Finland, and the United States; the last operated the type as a training aircraft for test pilots. 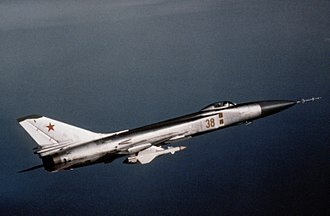 As the dawn of the Jet Age arrived, Sweden foresaw that there would be a need for a jet fighter that could intercept bombers at high altitude and also successfully engage fighters. During September 1949, the Swedish Air Force, via the Swedish Defence Material Administration, released its recently formulated requirement for a cutting-edge interceptor aircraft that was envisioned to be capable of attacking hostile bomber aircraft in the transonic speed range. 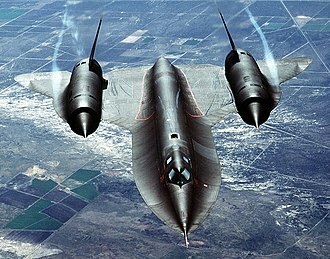 As released, this requirement specified a top speed of Mach speed 1.4 to 1.5; however, during 1956, the specified speed was revised upwards to Mach 1.7-1.8. 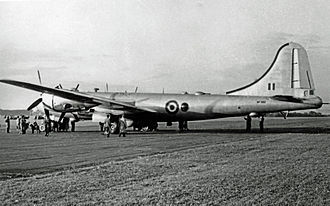 Other specified needs were that it had to be flown by a single pilot yet capable of conducting combat operations under all weather conditions or at night while being operated out of relatively austere airstrips while carrying all of the equipment needed to neutralise modern jet bombers. 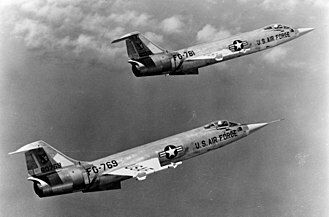 Although other interceptors, such as the US Air Force's F-104 Starfighter, were being conceived during the same period, the new fighter would have to undertake a role unique to Sweden. 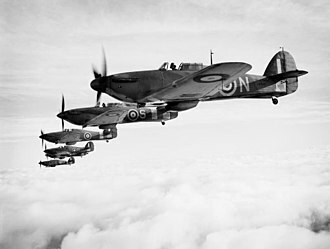 Specifically, it was required to include the ability to operate from reinforced public roads, which were to be used as part of wartime airbases; the aircraft would also need to be refuelled and rearmed in no greater than ten minutes by conscripts that had minimal training. In response to the release of the requirement, Swedish aircraft manufacturer SAAB commenced work on producing an aircraft to fulfil the identified role. Preliminary studies had found that the majority of the critical issues which were posed in meeting the requirement could be resolved via the adoption of a delta wing configuration. However, this posed difficulties of its own in that, so that to obtain an aerodynamically desirable location, the forward fuselage would need to be extended and, as a consequence, the aircraft would become unnecessarily heavy. The optimum solution to this conundrum was uncovered in the form of the double delta wing. However, this wing configuration was unexplored quantity, and accordingly, SAAB's design staff on the project, headed by aircraft engineer Erik Bratt and a team of more than 500 technicians, opted to design and construct a small jet aircraft for the purpose of exploring the behaviour of the revolutionary new wing. During 1956, the first operational version of the Draken, designated as the J 35A, was ordered into quantity production. During February 1958, the first production aircraft performed its first flight. The Saab 35 Draken is a fighter aircraft, equipped with a distinctive double delta wing. 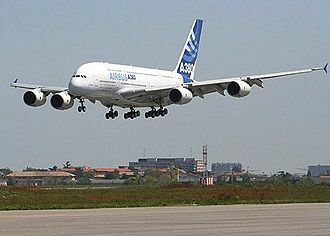 According to Flight International, it is difficult to differentiate between the fuselage and the wing. The design anticipates what would later be known as a ‘blended wing-body’. The fuselage has a circular section, and the inboard portion of the wing is a large-chord surface which extended almost to the engine intakes. It was possible to dispense with a tailplane, resulting in a clean, simple overall design. The Draken used a unique double-delta wing. The leading edge of the inner wing was swept back 80° for high-speed performance, and the outer wing 60° for good performance at low speeds. The cockpit of the Draken featured mostly Swedish-sourced instrumentation. Successive models introduced various improvements to the cockpit fittings, such as the revised canopy and new avionics. For export customers, the Draken was outfitted with a Ferranti-built Airpass II fire-control radar, which was effective for acquiring various air-to-air or air-to-surface targets, along with a ground-mapping mode working in conjunction with the aircraft's navigation systems. 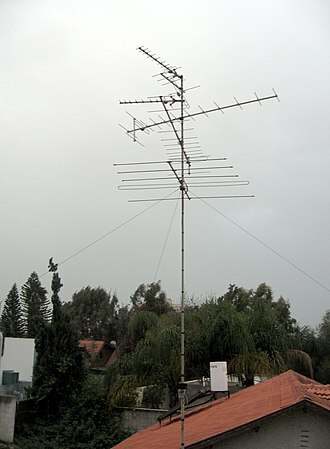 Typically, two separate radio units would be installed, along with a high-speed data link and two navigation systems. As there is no natural feedback placed upon the stick, artificial forces were generated by a q-feel system. The Draken was also fitted with a three-axis autopilot. The fuselage of the Draken consisted of two sections, front and rear, joined by bolts. The forward section, which was integral with the intake ducts and neighbouring wing structure, accommodates the fire-control radar, cockpit, nose undercarriage, integral fuel tanks and various systems. The rear portion, which was manufactured as a single piece alongside the rest of the inner wing, contained the engine and afterburner, bag-type fuel tanks, armament, main landing gear, and other systems. The flight control surfaces consisted of a rudder, along with inboard and outboard elevons, the outer sections being fitted with mass-balance weights. Each surface was operated by a tandem hydraulic jack, which was connected to separate circuits. As a weight-saving measure, the hydraulic systems would operate at a line pressure of 210 kp/cm2 (20.590 kPa), which would be greater than double the pressure used in the earlier Saab 29 Tunnan. Propulsion was provided by a single Svenska Flygmotor RM6B/C turbojet engine, a licence-built model of the Rolls-Royce Avon 200/300 engine. 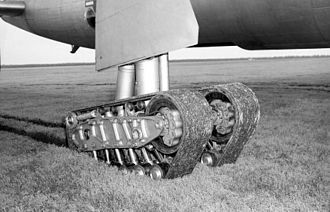 A ram turbine, positioned under the aircraft's nose, provided emergency power, while the engine also featured a built-in emergency starter unit. In order to reduce its landing speed when required, the Draken was equipped with a drogue parachute. The principal armament was carried externally, up to four AIM-9 Sidewinder air-to-air missiles were carried on hard points beneath the wings and fuselage; alternative payloads include a variety of bombs and rockets, along with provisions for the installation of a pair of 30 mm cannons, located within each of the inboard wing panels. In place of the cannons, additional fuel tanks could be fitted in the same space. For aerial reconnaissance missions, a variety of camera pods could be carried underneath the fuselage. At the end of 1959, deliveries of the J 35A Draken commenced to the SAF, the first unit to receive the type being fighter wing F13, stationed at Norrköping. During March 1960, the Drakens of unit F13 participated in a three-day long exercise, flying by night and day while operating under a state of "highest readiness" throughout. 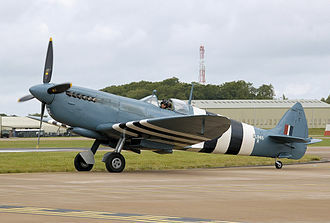 According to Flight International, the introduction to service of the J 35A was "very smooth", and that the scramble and turn-round times had been found to be "most satisfactory". By the end of 1960, multiple wings had been equipped with the Draken and had attained operational status. Ex-RDAF RF-35XD N217FR operated by the National Test Pilot School takes off from the Mojave Spaceport. Although the J 35 Draken was not designed to serve as a dog fighter, it proved to have a good quick-turn capability and was a capable fighter plane. 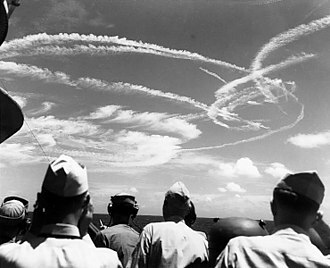 The early models were intended purely to perform the air defense mission. However, in order to assist pilots in converting to the type, Saab produced a small number of twin-seat J 35C trainer aircraft, the first of which having been completed during December 1959. During 1959, an improved air defence fighter model, designated as the J 35B, was developed, which featured improved performance and equipment over the J 35A. Amongst other things, it was powered by an improved engine fitted with an enlarged afterburner, a redesigned rear fuselage, a new Saab-built S.7 collision-course gunsight and fire-control radar, and integration with Sweden's STRIL.60 air defence control network. A total of 651 Drakens were manufactured by Saab. Sweden's fleet of Drakens comprised a total of six different versions, while two additional models of the Draken were offered to prospective export customers. The final model of the Draken to be produced was the J 35F, which was also the final version to remain in Swedish service. Its export customers included Denmark and Finland. In May 1985, the Austrian Air Force purchased 24 J 35Ds, which had been refurbished by Saab. The J 35 Draken design underwent several upgrades. The last of these was the J 35J version, which was produced during the late 1980s; by this point, the Draken had been almost entirely replaced by the Saab 37 Viggen in SAF service. The Draken J 35J was effectively a service life extension programme, which had been initiated as a result of the impending delivery of the new Saab JAS 39 Gripen having suffered several delays. The extension program was intended to keep the Draken flying into the 2000s but, as a consequence of budgetary cutbacks and high maintenance costs being incurred with the type, the Draken was phased out of Swedish service in December 1999, although the aircraft has since remained operational in limited numbers within both military and civilian roles. Saab 35FS Draken (DK-241), formerly in Finnish service, in the Aviation Museum of Central Finland. In the background is two-seat trainer Saab 35CS Draken (DK-270). All Drakens functioned as interceptors with limited air-to-ground capability; the sole exception to this rule was the Danish Drakens, which functioned as strike aircraft and were capable of carrying a mixture of AGM-12 Bullpup air-to-ground missiles, electronic countermeasures, and increased internal and external fuel storage. The Danish Drakens were the heaviest of the series to have flown. During 1993, the last of the Danish J 35 fleet were retired. During the 1990s, Finland updated its 35XS fleet with new avionics, cockpit displays, navigational/attack systems, and electronic countermeasures; these were finally retired in 2000 to be replaced by F/A-18 Hornets. Austria was the last country to have the Draken in active military service. The Austrian Air Force bought refurbished J 35Ds. 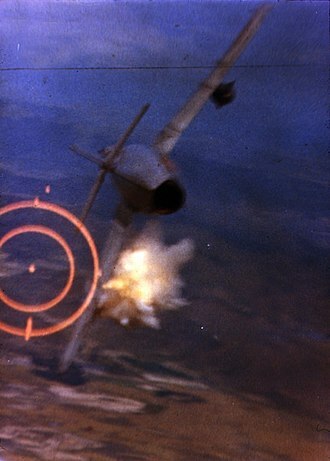 This was the last Austrian Air Force fighter plane fitted with internal cannons to perform their lone air-to-air armament because of the restriction in the Austrian State Treaty of 1955, which had forbidden their carrying air-to-air missiles. During 1993, this restriction was dropped as a response to airspace violations made by neighbouring Yugoslavian air combat services. American AIM-9 Sidewinder missiles were purchased. In 2005, these Drakens were retired, having been replaced by former Swiss Air Force F-5 Tiger IIs, while waiting for new Eurofighter Typhoons to take their place in the long term. In the United States, the National Test Pilot School (NTPS) operated six Drakens that were formerly in Danish service. They were retired in 2009. Also known as Lilldraken, a scaled-down, proof of concept experimental aircraft to evaluate the double delta wing configuration, not specifically a Draken variant but included here for sequence purposes. Fighter version, total production 90 including prototypes. The J 35As were delivered between 1959 and 1961. The tail section was lengthened after the 66th aircraft to house a new afterburner for additional thrust, the longer tail cone unexpectedly reduced drag. This forced the installation of a retractable tail-wheel. The two versions were nicknamed Adam kort (Adam short) and Adam lång (Adam long). The Adam was fitted with a French Cyrano Radar (Swedish designation PS-02) (same as on the Mirage III) as the Swedish radar hadn't been developed in time. Fighter version, built and delivered between 1962 and 1963, total production 73. This variant had improved radar and gun sights, and was also fully integrated into the Swedish STRIL 60 system; a combat guidance and air surveillance system. Fitted with a Swedish built radar PS-03. 25 J 35As with short tail sections rebuilt into a twin-seated trainer version. The minor modification meant that the aircraft could easily be converted back to a J 35A standard if necessary. The trainer version lacked armament. Fighter version, delivered between 1963 and 1964, total production 120. The aircraft had a new and more powerful Rolls-Royce Avon 300 (RM6C), which could deliver 77.3 kN thrust when using its afterburner. This was also the fastest Draken version, capable of accelerating until out of fuel. It was also the last Draken to carry two cannons. Fitted with the PS-03 radar. Reconnaissance version, total production 60 with 32 built from scratch and the remainder converted from the J 35D model. The armament and radar was removed and several cameras (of ortho and oblique types) fitted. The aircraft was unarmed to make room for the nine cameras of Vinten design (five in the nose and four in the fuselage) but was fitted with a countermeasure system to increase its survivability. It also carried an active infrared reconnaissance system of EG&G design in a pod fitted to a hardpoint. Fighter version, delivered between 1965 and 1972, total production: 230. This variant had improved electronics and avionics, e.g. integrated radar, aim and missile systems. 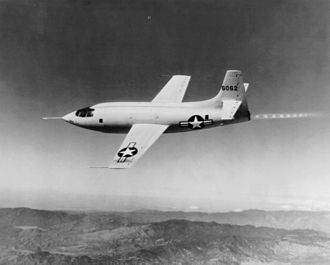 The aircraft's main armament were IR and SARH versions of the Hughes Falcon missile originally intended for the J 35D, but one of the cannon was removed to make space for more avionics. The J 35F2 was a J 35F, produced with a Hughes N71 Infra-red search and track sensor. This was a change in the production line from the no. 35501 airframe. 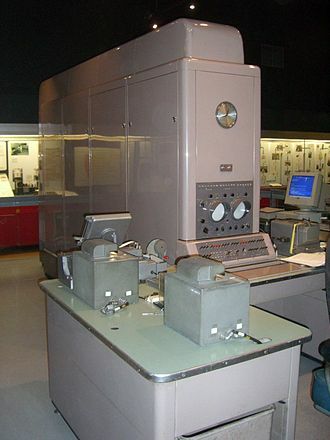 The Hawé mods I & II where carried out on the P/S-01/011 radar sets in the early 1980s to improve resistance to ECM. In 1985 the Swedish government decided to modify 54 J 35F2s to the J 35J standard. In 1987, 12 more modifications were ordered: between 1987 and 1991, the aircraft received a longer lifespan, modernized electronics and cannon, additional two Sidewinder (AIM-9P) pylons under the air intakes and increased external fuel capacity. The final operational J 35J flew for the last time in 1999. Proposed export version for the Swiss Air Force; none sold or delivered. 12 fighter version units for the Finnish Air Force; built by Saab and assembled under licence by Valmet in Finland. The "S" stood for "Suomi" (Finland). Used J 35Bs sold to Finland. Used J 35F1s sold to Finland. Used SK 35Cs sold to Finland. In the mid-1980s, Saab re-purchased 24 J 35D aircraft from the Swedish Air Force and converted them into the J 35Ö version (also called J 35OE in English literature) for export to Austria. Austria bought AIM-9P5 all aspect Sidewinders for these aircraft during the war in former Yugoslavia. Before it was decided to develop the JAS 39 Gripen in the 1970s, studies were undertaken on modification for low flight hour J 35F airframes. The most ambitious modification in the program. 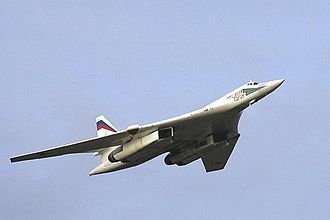 The proposed modifications were new outer wing, additional weapon stations, RBS 15 capability, the addition of canards by the air intakes for increased maneuverability and maximum take-off weight increased to 15 000 kg. Essentially the aircraft that became the J 35J. The total number of Drakens produced and delivered was 644. The Saab 35 Draken was withdrawn from military use in 2005. Several aircraft fly in the civilian service, mainly by the National Test Pilot School. A small number of Drakens are still with civilian owners mainly in the United States, many former-operational aircraft have been preserved in the operating nations. ^ The names of Swedish combat aircraft are always in the definite form, like Lansen or Gripen. ^ a b c d e f g h i j k l m n o p Flight International 30 December 1960, p. 1017. ^ a b Andersson 1989, p. 125. ^ a b Andersson 1989, p. 127. ^ Andersson 1989, p. 126. ^ a b c d e Andersson 1989, p. 128. ^ Flight International 30 December 1960, pp. 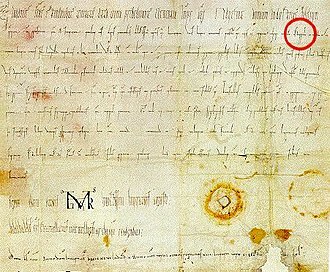 1017–1018. ^ a b c d Flight International 30 December 1960, p. 1020. ^ Andersson, Hans G. (1962). "J 35 Draken". Teknisk tidskrift (31): 786. Retrieved 30 April 2018. ^ a b c d e f Flight International 30 December 1960, p. 1018. ^ a b Flight International 30 December 1960, pp. 1018, 1020. ^ a b c d e f Andersson 1989, p. 135. ^ a b c d Andersson 1989, p. 133. ^ "Saab 35 Draken." Global aircraft. Retrieved 4 June 2012. ^ "Draken Jets Retired To Good Homes." NTPS. Retrieved 2 February 2017. ^ a b c d Andersson 1989, p. 129. ^ a b c d e Andersson 1989, p. 130. ^ Andersson 1989, p. 13. ^ J 35F, SE: AEF . ^ a b c d e f g h Andersson 1989, p. 136. ^ J 35J, SE: AEF . ^ a b Andersson 1989, p. 134. ^ a b c Widfeldt 1995, p. 156. ^ Schrøder, Hans (1991). "Royal Danish Airforce". Ed. Kay S. Nielsen. 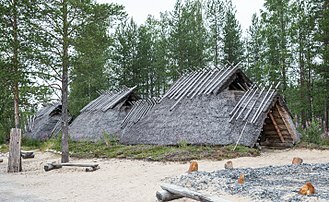 Tøjhusmuseet, 1991, pp. 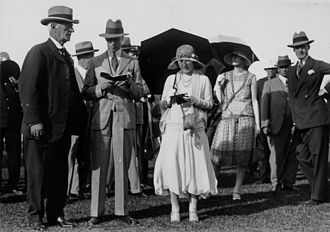 1–64. ISBN 87-89022-24-6. ^ Wilson 2000, p. 123. ^ Laukkanen 2009, p. 101. Eden, Paul (ed). 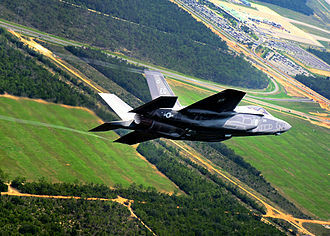 The Encyclopedia of Modern Military Aircraft. London: Amber Books, 2004. ISBN 1-904687-84-9. "Saab: Sweden's Advanced Combat Aircraft". Flight International, 30 December 1960. pp. 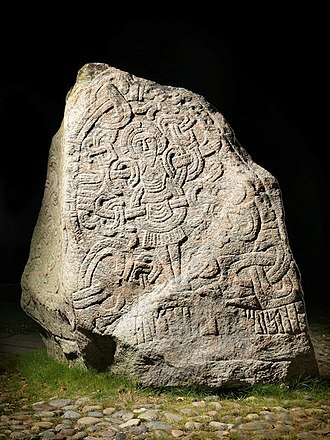 1017–1020. Wilson, Stewart. 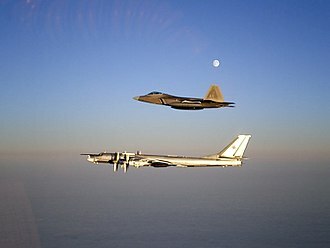 Combat Aircraft since 1945. Fyshwick, AU: Aerospace Publications, 2000. ISBN 1-875671-50-1. 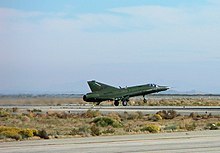 Wikimedia Commons has media related to Saab 35 Draken. The only flying Saab J 35J Draken (Kite/Dragon) in Swedish colours is operated by heritage flight of the Flygvapnet (Swedish Air Force) – 2012. The Saab 37 Viggen is a Swedish single-seat, single-engine, short-medium range combat aircraft. The Viggen holds the distinction of being the first canard design to be produced in quantity, several distinctive variants of the Viggen were produced to perform the roles of strike fighter, aerial reconnaissance, maritime patrol aircraft and a two-seat trainer. In the late 1970s, the all-weather fighter-interceptor aircraft JA37 variant was introduced, in November 2005, the Viggen was retired from service by the Swedish Air Force, the sole operator of the type, having been replaced by the newer Saab JAS39 Gripen. The Viggen was initially developed as a replacement for the Saab 32 Lansen in the attack role. 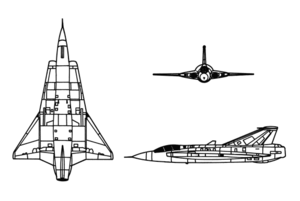 Between 1952 and 1957, the first studies towards what would become the Viggen were carried out, over 100 different concepts were examined in these studies, involving both single- and twin engine configurations, both traditional and double delta wings, and canard wings. Even VTOL designs were considered, with separate lift engines, but were identified as being unacceptable. From the onset, the Viggen was planned as a weapon system, to be operated in conjunction with the newest revision of Swedens national electronic air defense system. It was used as the standard platform, capable of being efficiently adapted to perform all tactical mission roles. 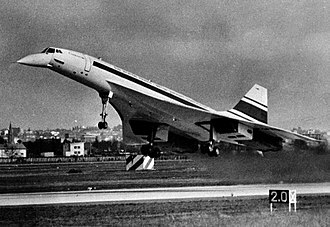 Other requirements included supersonic ability at low level, Mach 2 performance at altitude, the aircraft was designed from the beginning to be easy to repair and service, even for personnel without much training. 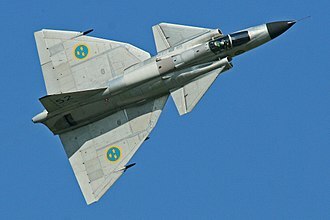 However, Bruzelius theory has been discredited by Simon Moores and Jerker Widén, in December 1961, the Swedish government gave its approval for the development of Aircraft System 37, which would ultimately become the Viggen. 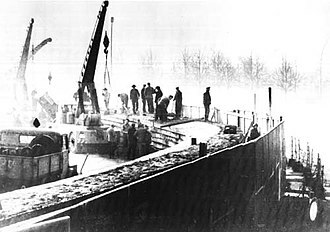 In February 1962, approval of the configuration was given and was followed by a development contract in October 1962. According to aviation authors Bill Gunston and Peter Gilchrist, the project was by far the largest industrial development task ever attempted in Sweden, during the 1960s, the Viggen accounted for 10 per cent of all Swedish R&D funding. 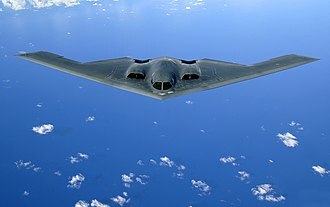 A bomber is a combat aircraft designed to attack ground and sea targets by dropping air-to-ground weaponry, firing torpedoes or deploying air-launched cruise missiles. In 1912, during the First Balkan War, Bulgarian Air Force pilot Christo Toprakchiev suggested the use of aircraft to drop bombs on Turkish positions, captain Simeon Petrov developed the idea and created several prototypes by adapting different types of grenades and increasing their payload. This is deemed to be the first use of an aircraft as a bomber, the first heavier-than-air aircraft purposely designed for bombing were the Italian Caproni Ca 30 and British Bristol T. B.8, both of 1913. The Bristol T. B.8 was an early British single engined biplane built by the Bristol Aeroplane Company, under the command of Charles Rumney Samson, a bombing attack on German gun batteries at Middelkerke, Belgium was executed on 25 November 1914. The dirigible, or airship, was developed in the early 20th century, early airships were prone to disaster, but slowly the airship became more dependable, with a more rigid structure and stronger skin. Prior to the outbreak of war, Zeppelins, a larger and these were the first long range, strategic bombers. Although the German air arm was strong, with a total of 123 airships by the end of the war, they were vulnerable to attack and engine failure, German airships inflicted little damage on all 51 raids, with 557 Britons killed and 1,358 injured. The German Navy lost 53 of its 73 airships, and the German Army lost 26 of its 50 ships, the Caproni Ca 30 was built by Gianni Caproni in Italy. It was a biplane with three 67 kW Gnome rotary engines and first flew in October 1914. Test flights revealed power to be insufficient and the engine layout unworkable, the improved design was bought by the Italian Army and it was delivered in quantity from August 1915. Bombing raids and interdiction operations were carried out by French. Sustained attacks with a view to interrupting the enemys railway communications, in conjunction with the main operations of the Allied Armies. The most important bombers used in World War I were the French Breguet 14, British de Havilland DH-4, German Albatros C.
The Royal Danish Air Force is the aerial warfare force of Denmark and one of the four branches of the Danish Defence. 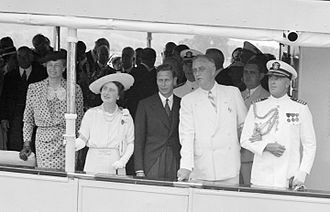 Initially being components the Army and Navy, it was made a service in 1950. It main purpose, is to serve as enforcer of Danish airspace, the air force was led by Lieutenant General C. C. J. Førslev, who had served as colonel in the army. The national command was located at Værløse Air Base which served as Command East, Royal Air Force volunteer and former member of the Free Norwegian Forces in England, Kaj Birksted, was appointed chief of the flying staff. Further, the East and West commands lacked experience and knowledge of the newly delivered Gloster Meteor, the Danish armed forces received 38 surplus Supermarine Spitfire H. F. Mk. One survived for a number of years in a childrens playground, the one surviving instructional airframe was restored to depict the number 401 Spitfire Mk. 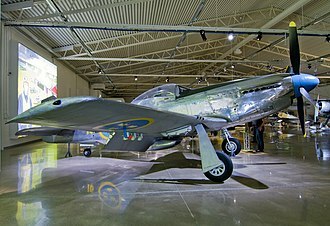 This airplane is now preserved at Dansk Veteranflysamling at Stauning Airfield in Jylland, pilot training was initially based at Avnø from May 1946 until 1951, when the school were transferred to the U. S.
under the Military Assistance Programme. The school at Avnø continued to conduct tests to choose the candidates for the American training programme, in 1947 the RDAF established a school for aircraft mechanics, based at Værløse Air Base. In 1951, the RDAF officers school was inaugurated at Rungstedlund north of Copenhagen, the air force received six F-84E Thunderjet and 238 F-84G Thunderjet as military aid from the US, and formed five new squadrons at Karup Air Base from 1952 to 1954. The rapid expansion caused problems as neither two-seaters nor flight simulators were available, to avoid further casualties the air force established a training squadron of two-seated T-33As in 1956 to train US-educated pilots to navigate under local weather conditions. Furthermore, squadron 722 was changed to function as rescue squadron in 1956 and was strengthened by seven Sikorsky S-55 helicopters in 1957, in 1962 the Royal Danish Armys four SAM batteries based on Nike missiles were transferred to the air force. In 1965 four batteries of Hawk missiles were deployed close to the Nike batteries to protect them from low altitude aircraft, in the 1960s and 1970s the RDAF operated a number of US financed Lockheed F-104G Starfighters, North American F-100D and F-100F Super Sabres, and several other types. 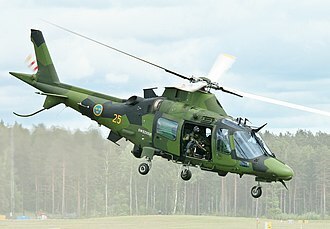 In 1971 the Danish army created the Royal Danish Army Flying Service as the first air-unit outside the air force, since its creation in 1950 and it had observation helicopters and piston-engined artillery spotting aeroplanes. In 1977 the Danish Naval Air Squadron was extracted from squadron 722 to the Danish navy, in a joint arms purchase four NATO countries, Norway and Belgium introduced the General Dynamics F-16 Fighting Falcon as their common strike fighter in January 1980. The F-16 was bought by additional NATO countries and Turkey, in 1982 the number of fighter aircraft was reduced by 12 units. General Dynamics F-16 is introduced to replace initially the F-100 and the F-104G, the Royal Danish Naval Air Service is strengthened by eight Westland Lynx Mk.80 from 1980, replacing the Alouette III helicopters. Hydraulics is a technology and applied science using engineering and other sciences involving the mechanical properties and use of liquids or fluids. At a very basic level, hydraulics is the version of pneumatics. Fluid mechanics provides the foundation for hydraulics, which focuses on the applied engineering using the properties of fluids. In fluid power, hydraulics are used for the generation, hydraulic topics range through some parts of science and most of engineering modules, and cover concepts such as pipe flow, dam design and fluid control circuitry, pumps. The principles of hydraulics are in use naturally in the body within the heart. Free surface hydraulics is the branch of hydraulics dealing with surface flow, such as occurring in rivers, lakes, estuaries. Its sub-field open channel flow studies the flow in open channels, the word hydraulics originates from the Greek word ὑδραυλικός which in turn originates from ὕδωρ and αὐλός. Early uses of water power date back to Mesopotamia and ancient Egypt, other early examples of water power include the Qanat system in ancient Persia and the Turpan water system in ancient Central Asia. The Greeks constructed sophisticated water and hydraulic power systems, an example is the construction by Eupalinos, under a public contract, of a watering channel for Samos, the Tunnel of Eupalinos. 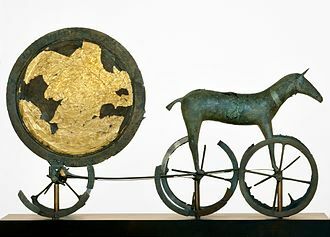 An early example of the usage of hydraulic wheel, probably the earliest in Europe, is the Perachora wheel, notable is the construction of the first hydraulic automata by Ctesibius and Hero of Alexandria. Hero describes a number of working machines using hydraulic power, such as the force pump, in ancient China there was Sunshu Ao, Ximen Bao, Du Shi, Zhang Heng, and Ma Jun, while medieval China had Su Song and Shen Kuo. Du Shi employed a waterwheel to power the bellows of a blast furnace producing cast iron, Zhang Heng was the first to employ hydraulics to provide motive power in rotating an armillary sphere for astronomical observation. In ancient Sri Lanka, hydraulics were used in the ancient kingdoms of Anuradhapura. The discovery of the principle of the tower, or valve pit. By the first century AD, several irrigation works had been completed. 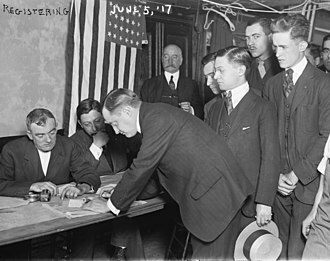 Conscription, or drafting, is the compulsory enlistment of people in a national service, most often a military service. Conscription dates back to antiquity and continues in countries to the present day under various names. The modern system of national conscription for young men dates to the French Revolution in the 1790s. Most European nations copied the system in peacetime, so that men at a certain age would serve 1–8 years on active duty and those conscripted may evade service, sometimes by leaving the country. As of the early 21st century, many no longer conscript soldiers. 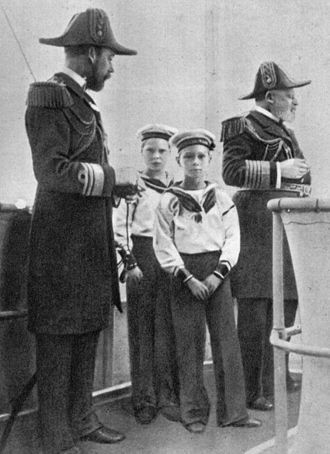 The ability to rely on such an arrangement, presupposes some degree of predictability with regard to both war-fighting requirements and the scope of hostilities, many states that have abolished conscription therefore still reserve the power to resume it during wartime or times of crisis. Around the reign of Hammurabi, the Babylonian Empire used a system of conscription called Ilkum, under that system those eligible were required to serve in the royal army in time of war. During times of peace they were required to provide labour for other activities of the state. 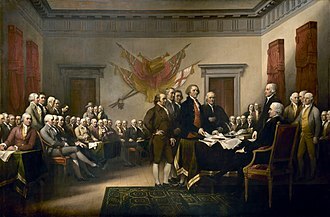 In return for service, people subject to it gained the right to hold land. It is possible that this right was not to hold land per se, various forms of avoiding military service are recorded. While it was outlawed by the Code of Hammurabi, the hiring of substitutes appears to have practiced both before and after the creation of the code. Later records show that Ilkum commitments could become regularly traded, in other places, people simply left their towns to avoid their Ilkum service. 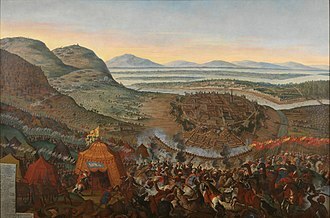 Another option was to sell Ilkum lands and the commitments along with them, with the exception of a few exempted classes, this was forbidden by the Code of Hammurabi. The levies raised in this way fought as infantry under local superiors, although the exact laws varied greatly depending on the country and the period, generally these levies were only obliged to fight for one to three months. 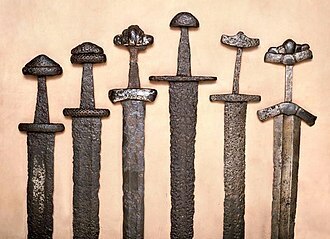 Most were subsistence farmers, and it was in everyones interest to send the men home for harvest-time, the bulk of the Anglo-Saxon English army, called the fyrd, was composed of part-time English soldiers drawn from the landowning minor nobility. An aircraft flight control surface is an aerodynamic device allowing a pilot to adjust and control the aircrafts flight attitude. Development of a set of flight control surfaces was a critical advance in the development of aircraft. The development of flight controls is what allowed stable flight. This article describes the control surfaces used on an aircraft of conventional design. Other fixed-wing aircraft configurations may use different control surfaces but the principles remain. The controls for rotary wing aircraft accomplish the same motions about the three axes of rotation, but manipulate the flight controls in a completely different manner. The Wright brothers are credited with developing the first practical control surfaces and it is a main part of their patent on flying. Unlike modern control surfaces, they used wing warping, in an attempt to circumvent the Wright patent, Glenn Curtiss made hinged control surfaces, the same type of concept first patented some four decades earlier in the United Kingdom. Hinged control surfaces have the advantage of not causing stresses that are a problem of wing warping and are easier to build into structures, an aircraft is free to rotate around three axes that are perpendicular to each other and intersect at its center of gravity. To control position and direction a pilot must be able to control rotation about each of them, the lateral axis, known as transverse axis, passes through an aircraft from wingtip to wingtip. Rotation about this axis is called pitch, pitch changes the vertical direction that the aircrafts nose is pointing. The elevators are the control surfaces for pitch. 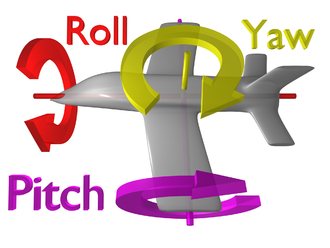 The longitudinal axis passes through the aircraft from nose to tail, rotation about this axis is called roll. The angular displacement about this axis is called bank, the pilot changes bank angle by increasing the lift on one wing and decreasing it on the other. This differential lift causes rotation around the longitudinal axis, the ailerons are the primary control of bank. The rudder has an effect on bank. 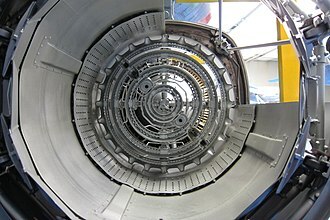 An afterburner is a component present on some jet engines, mostly those used on military supersonic aircraft. Its purpose is to provide an increase in thrust, usually for supersonic flight, afterburning is achieved by injecting additional fuel into the jet pipe downstream of the turbine. Pilots can activate and deactivate afterburners in-flight, and jet engines are referred to as operating wet when afterburning is being used, an engine producing maximum thrust wet is at maximum power, while an engine producing maximum thrust dry is at military power. 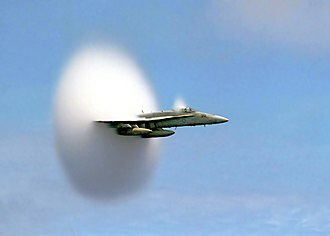 Jet-engine thrust is governed by the principle of mass flow rate. Thrust depends on two things, the velocity of the exhaust gas and the mass of that gas, a jet engine can produce more thrust by either accelerating the gas to a higher velocity or by having a greater mass of gas exit the engine. Designing a basic turbojet engine around the second produces the turbofan engine. Turbofans are highly efficient and can deliver high thrust for long periods. To generate increased power with a compact engine for short periods. The afterburner increases thrust primarily by accelerating the exhaust gas to a higher velocity, while the mass of the fuel added to the exhaust does contribute to an increase in exhaust mass, this effect is negligible compared to the increase in exhaust velocity. This temperature is known as the Turbine Entry Temperature, one of the engine operating parameters. After passing the turbine, the gas expands at a constant entropy. The afterburner injects fuel downstream of the turbine and reheats the gas, in conjunction with the added heat, the pressure rises in the tailpipe and the gas is ejected through the nozzle at a higher velocity. The mass flow is slightly increased by the addition of the fuel. 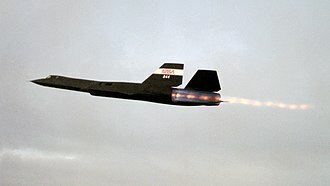 Afterburners do produce markedly enhanced thrust as well as a large flame at the back of the engine. This exhaust flame may show shock diamonds, which are caused by shock waves formed due to differences between ambient pressure and the exhaust pressure. 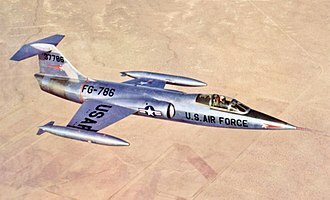 Lockheed F-104G Starfighter of 726 ESK in 1971. The fuselage of Concorde had an extremely high fineness ratio. Saab Gripen of the Swedish Air Force undergoing inflight refuelling. Gripen taking off from a road runway, that were part of the Bas 90 system.